Andrew had some of his funny moments. He started the game by ripping grass from the field and showering it down over his head. I know everyone has their pre-game rituals. Andrew’s is to become one with the field. He also has a tendency to run looking down at the ground (Funny that seems to be a habit I had when I started to play basketball in junior high.). At one point in the first half, the other team had the ball near the baseline and kicked the ball out for a goal kick. Andrew not looking up to see that play had stopped, or where he was, ran straight into the goal post with a nice thunk! Luckily he wasn’t running to fast. He just turned around and ran back down the field. 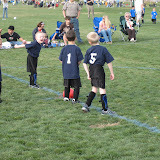 Soccer – First Game of Spring Season was published on April 03, 2007 by Jared Ottley.